Mr. Bimal Pal, Assistant Prof, passed B.Sc from Calcutta University followed by AMIE(ECE) and M.Tech(IT) from Bengal Engg.& Sc. University. He is currently teaching Microprocessor, Communication Engg,Digital Signal Processing & Data Communication& Networking. 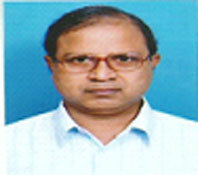 He has long industrial experience in Electronic Industry. His current research interest is in The Fourier Analysis of ECG-Signals using DSP.